Stainless Steel Pusher.an affordable, economical product from Tooltime products. Same quality as brand name manufactures at a fraction of the price. High-quality professional cuticle nipper “â¢Can be sterilized without rusting “â¢Lifetime guarantee““Mehaz Cobalt Stainless Steel Cuticle Nippers feature a double spring that allows free floating movements with no resistance. 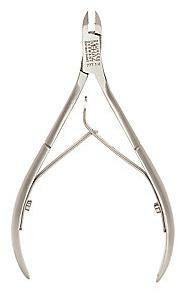 Mehaz is the leader in premium implements for the professional nail technician. “ ““Made by the finest craftsmen in Solingen, Germany. Stringent quality control standards ensure complete customer satisfaction. All Mehaz implements will provide a lifetime of service and have a lifetime guarantee. compact,lightweight and stainless steel.kit includes:ingrown nail file,cuticle pusher, #5 & #9 pusher,implement handle,under nail cleaner,spoon/under nail cleaner,2 pterygium removers.“an affordable,economical product from Tooltime products.same quality as brand name manufactures at a fraction of the price. style #3260p cuts artificial nails,non-breakable cutting edges.made of surgical,stainless steel which assures a long lasting cutting edge.the blades meet and cut at the very tip for precision work.the neck is strong enough not to break when cutting through plastic.the double spring is designed to operate smoothly and is guaranteed not to break.free sharpening. used for cutting down the artificial nail.an affordable,economical product from Tooltime products.same quality as brand name manufactures at a fraction of the price. Fits All Brands.Easy to change.Can be resharpened. Will never rust	stainless steel.Made in USA.